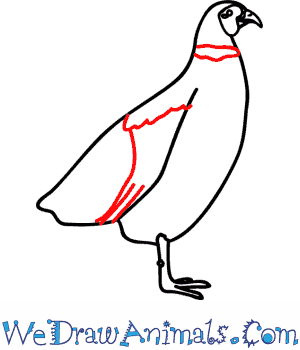 In this quick tutorial you'll learn how to draw a Pheasant in 7 easy steps - great for kids and novice artists. 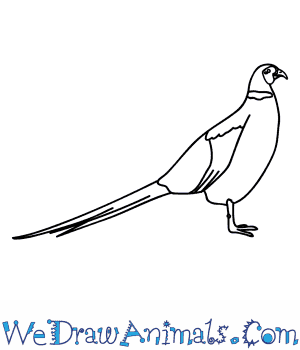 At the bottom you can read some interesting facts about the Pheasant. 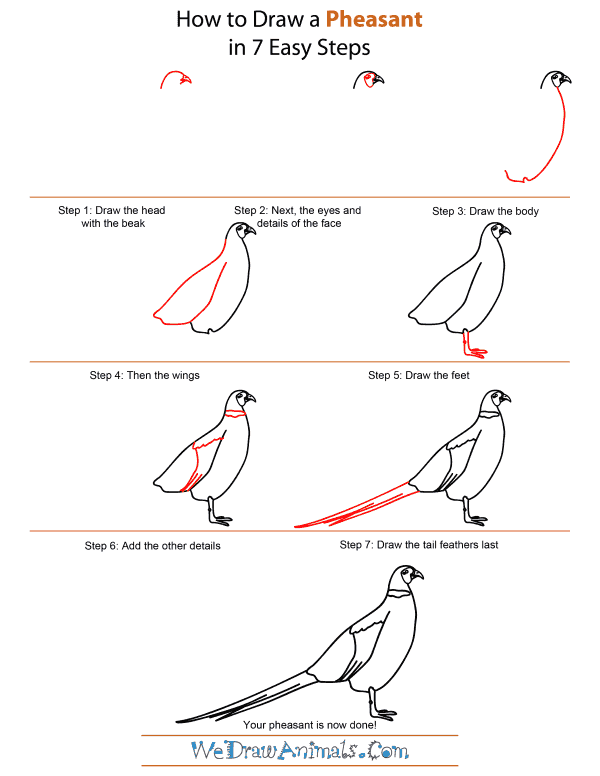 Step 1: A pheasant is easy to draw in 7 steps! Start with a dome for a head, that stops to make a slightly curved out beak. 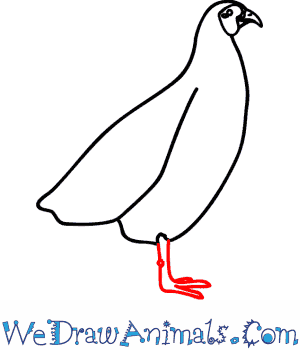 The beak should be made with a curved triangle, and a small line at the bottom to imply bottom beak. 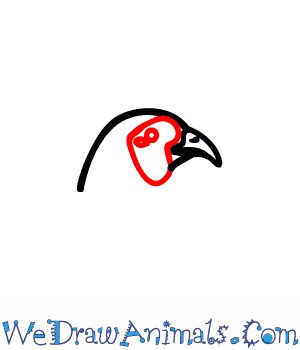 Add a dot at the top of the beak to make the nostril. 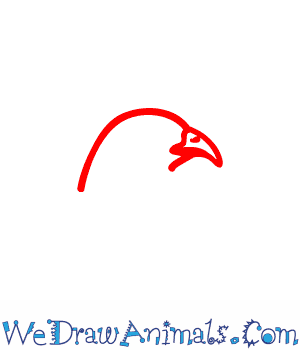 Step 2: Now draw a curved line that starts at the base of the beak, and curves back just underneath the head, before curving down to make a loop back up to the lower beak. Add a small oval for the eye. Step 3: Next we draw a long curved line from the bottom of the pheasant's face, down to make a belly. Make a small looping curve up, before making a rather flat slanting line going back and up, that curves up at the end. 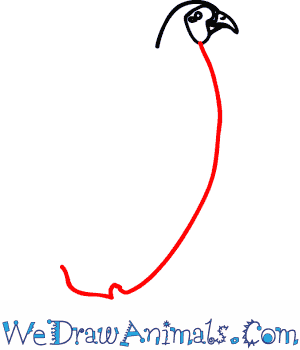 Step 4: Draw the wins by making a line that starts at the back of the head, then curves back into a slant. The end of the wing should have a small loop, that then curves down, then starts going flat back towards the front. Then it curves up and slants up below the neck, in the middle of the body. Step 5: Draw the feet by making two lines that go down, and then curves forward. Make three prongs at the front to make the claws at the bottom of the feet. Step 6: Let's put in some detail now. Add a small collar on the neck, and then a fuzzy line that starts halfway down the wing. Then make a curved line at the back of that fuzzy lien that goes down to the bottom of the wing. 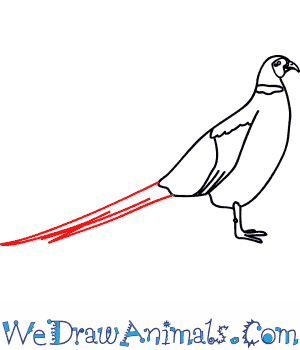 Put in a few more lines next to that one to imply separate feathers. Step 7: Now for the tail! Two long lines should come off the back bottom of the wing, going down and to the left. 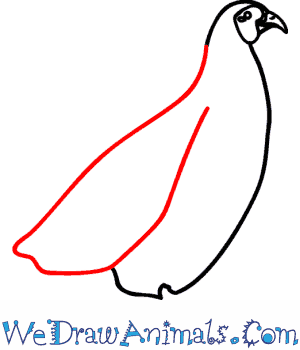 In the middle of the tail, draw more lines that connect with tips to the first two lines, again implying separate feathers. Pheasants are large birds that live all over the world. They are originally from Asia. There are at least 35 species of pheasants. Common pheasants are the most (as the name implies) common species. There are about 30 subspecies of common pheasants. Pheasants are hunted by humans for their meat and feathers. Female pheasants lay between eight and 12 eggs at a time. The eggs hatch after about one month. When the baby pheasants are a few weeks old, they fly away from their nest. Roosters about 36 inches long, and hens are about 20 inches long. Roosters have brilliant-colored feathers. Hens, on the other hand, have grey or brown feathers. Pheasants can run as fast as 10 miles per hour. They can fly at speeds of 35 to 45 miles per hour. Pheasants were brought to North America in the 1700s. The first state they inhabited was New York, and they then introduced to New Jersey, New Hampshire, and other states in the northeastern United States. They can now be found throughout the northwestern US and other parts of the country.